Click HERE to see or buy on Amazon. 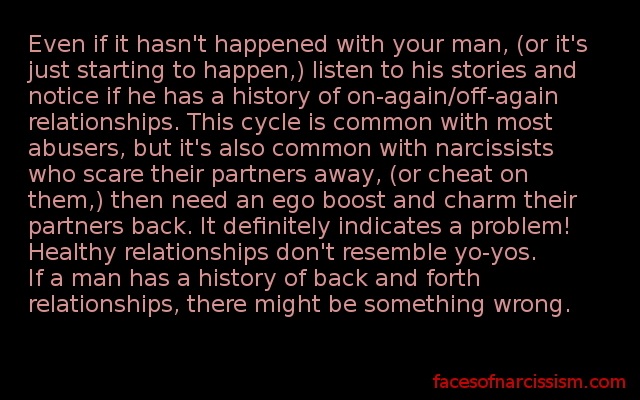 Even if it hasn’t happened with your man, (or it’s just starting to happen,) listen to his stories and notice if he has a history of on-again/off-again relationships. 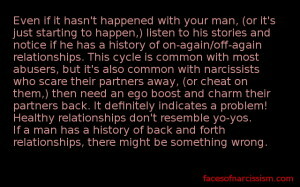 This cycle is common with most abusers, but it’s also common with narcissists who scare their partners away, (or cheat on them,) then need an ego boost and charm their partners back. It definitely indicates a problem! Healthy relationships don’t resemble yo-yos. If a man has a history of back and forth relationships, there might be something wrong.